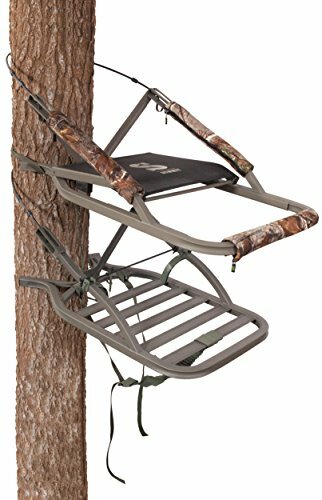 Climbing stand featuring a mesh flip up seat. Dead Metal technology helps to eliminate noise by filling critical parts with foam. QuickDraw cable retention system allows for quiet and easy cable attachment. Rapid Climb stirrups are comfort engineered and adjustable to fit any boot. Weighs 23 lbs. Platform measures 20in. x 36in. Weight capacity 300lbs.